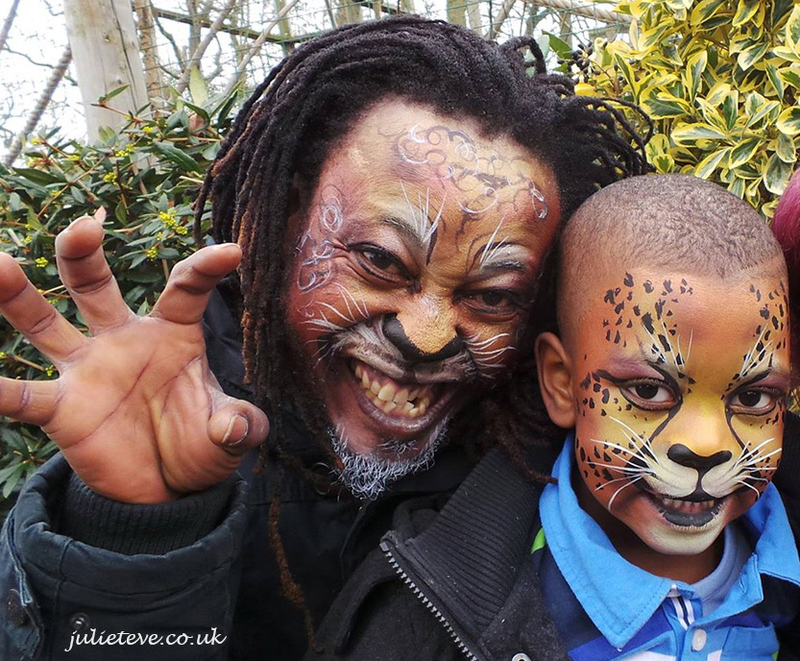 To celebrate Father’s Day in my face-painting cabin at Paradise Wildlife Park, we’re giving Dads a free face-paint with every paid-for child. So how brave are you really, chaps? The lion-hearted will find us by the lemurs! I’m proud to be a member of FACE – the trade association that promotes and raises standards and awareness of professional face and body artists. 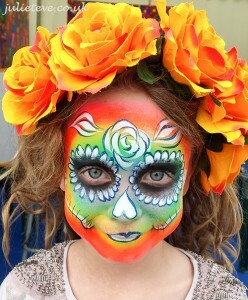 And the FACE website produced an amazing job for me last week, face-painting at the Royal Bath & West Show at Shepton Mallet, where I painted these two sugar skull sisters. Look on the bright side – it’s half-term! 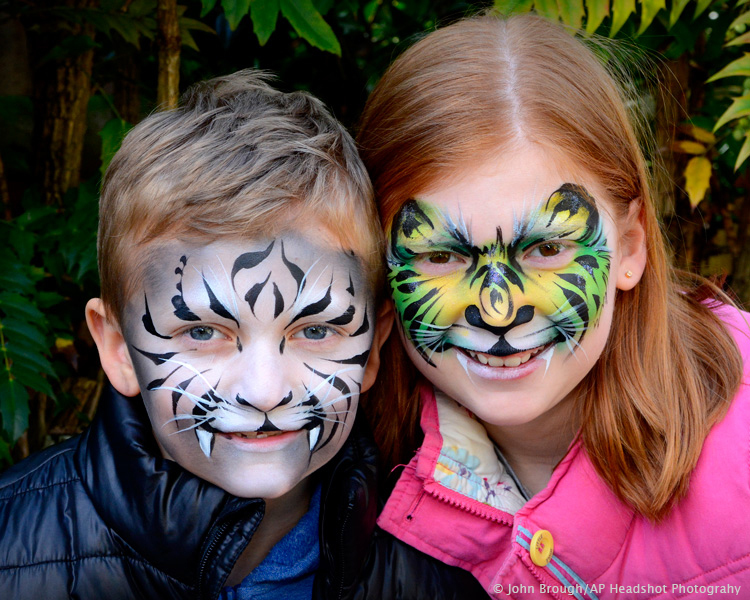 I try to keep the temperature tropical in my face-painting cabin at Paradise Wildlife Park, so drop in this half-term to get an exotic new holiday look without leaving home. We’re here every day – next door to the lemurs. I’m going to be painting at Paradise Wildlife Park all this Bank Holiday Weekend (April 30, May 1-2) – and I’ll have a dream team: on Saturday, wonderful Zoe Thornbury-Phillips will be painting with me; on Sunday and Monday, my fabulous daughter, Philly Eve Walker. Plus, on Saturday and Monday, photographer John Brough will be there making on-the-spot prints, like the one here. To see more of John’s work, check out Alternative-Portraits Photography on Facebook. 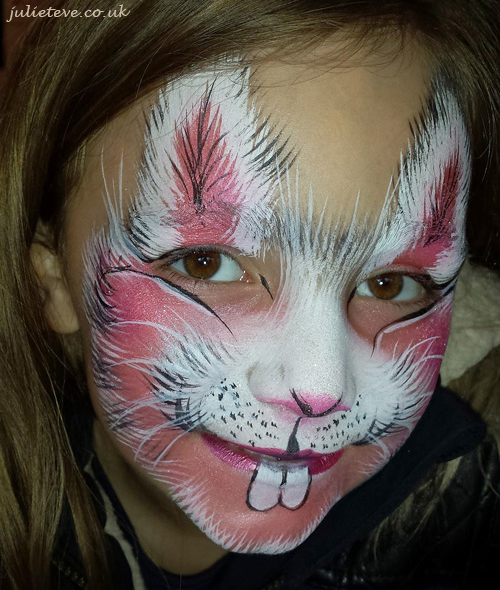 John Brough of Alternative-Portraits makes a welcome return to Paradise Wildlife Park this week, on Tuesday, Thursday and Friday (12, 14 & 15 April). 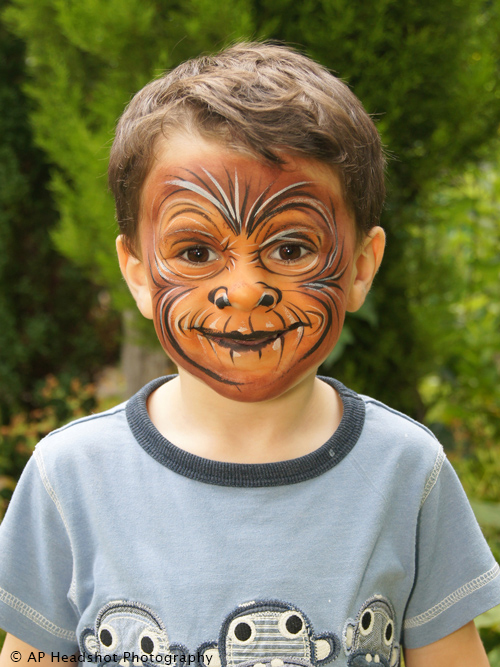 He’ll be at my face-painting cabin to take your photo and make prints for you on the spot, with a choice of fantastic jungly backgrounds to complement your new persona as a tropical butterfly or a big cat. To see more of John’s work, check out Alternative-Portraits Photography on Facebook. Dates for school holidays vary depending on where you live – and around Hertfordshire, that means another 10 whole days of fun. 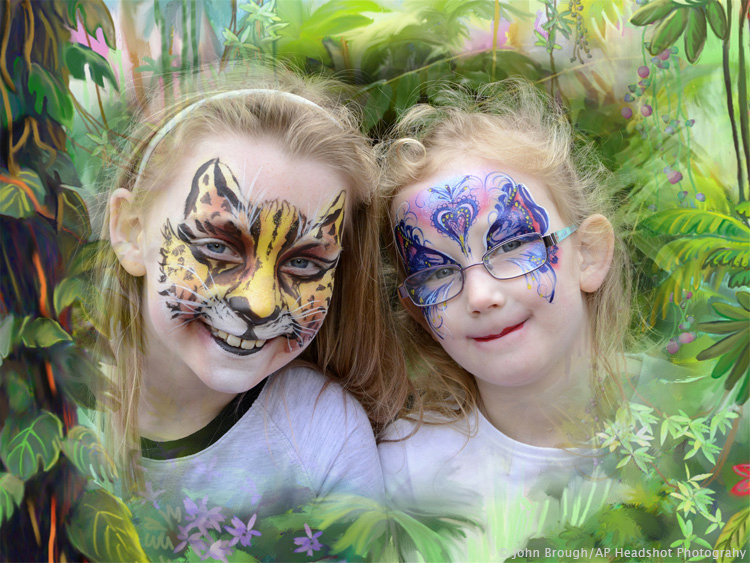 So why not come and visit us at Paradise Wildlife Park, where I’ll be painting naughty monkeys, terrifying tigers, birds and butterflies every day up to and including Sunday 17 April. You’ll find us opposite the lemurs, from 12 noon. See you there! 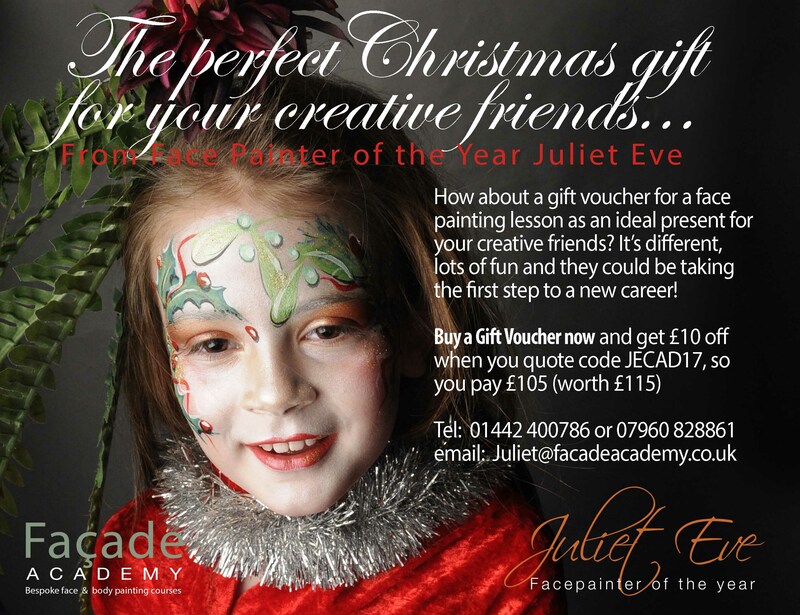 For full details – Façade Academy. I’ll be painting at Paradise Wildlife Park with Team Juliet over Easter – 25–28 March – and then every day during the school holidays, 2–17 April. I’m opposite the lemurs – just follow the bunnies and spring chickens! Thanks to everyone who came and contributed to this year’s Paradise Jam! And jam-packed it was, too, with painters both face and body, children, demonstrations, traders, nail artists, henna, balloons, glitter, airbrush, hair plaiting – and don’t forget Frankenstein. Once again, the day whizzed by in a colourful blur with so many wonderful designs flowing from the brushes rising to the heights of our theme, Nirvana. Children laughing at our entertainer AJ and an excellent raffle to finish off the day. Nearly 400 people came through the doors, browsed the stands and visited the zoo as well – a great bonus for the accompanying families. All in all, a great way to celebrate the 10th year of the Façade Academy. I hope you’ll be back next year – Monday of the February half-term. And perhaps in 2017 it might even be a two-day event! Check out the Facebook page for more photos and painty chat about the Jam. 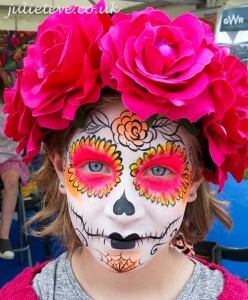 And thanks, too, Marsha Dunstan at Pinktree for all the lovely photos. I’ll be at Paradise Wildlife Park for the whole of half-term: 13-21 February. I’ll be joined by other members of Team Juliet from 12 noon in our usual spot, opposite the lemurs, every day except Monday, when visitors can join in the fun and have their faces painted the Paradise Jam event in in the big marquee from 12 noon. 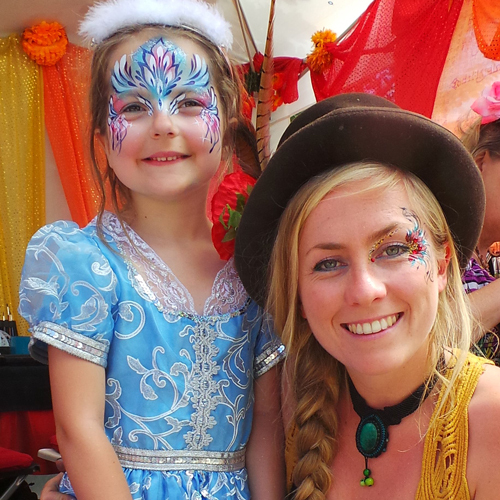 And you may well meet the next painting generation – my daughter Philly, pictured here with a small Blue Princess. For directions: Paradise Wildlife Park and for more about the Jam, check out the previous post on this page.